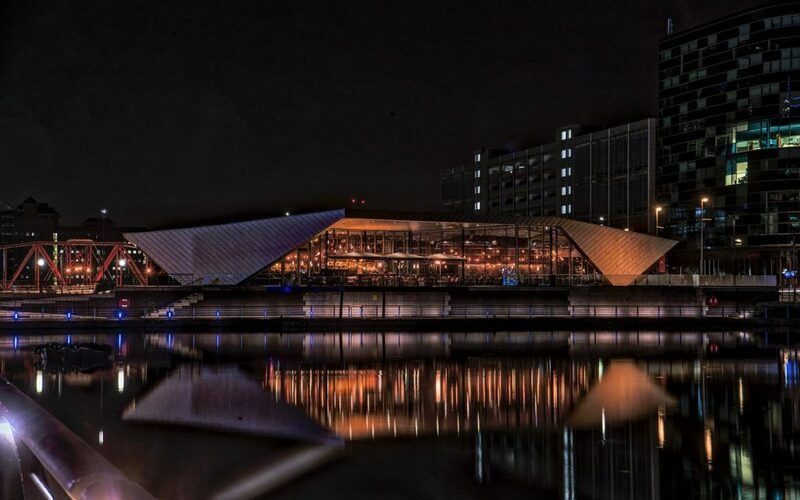 Designed by Reid Architects, The Bund is now an iconic new bar and restaurant on the waterfront next to the world-famous Lowry Centre for Living Ventures and the company’s 11th Alchemist venue. 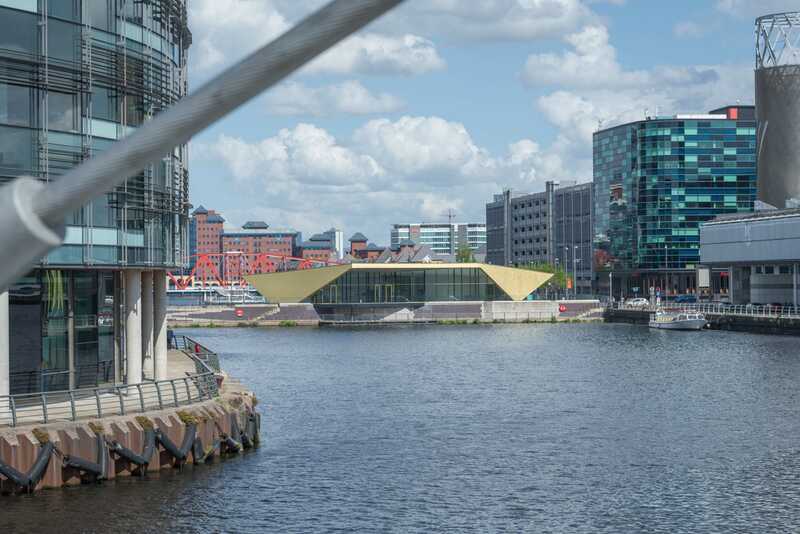 The design brief for The Bund provided scope for originality and creativity in meeting the key requirements to deliver a building that would be different and special, and draw together the diverse areas of Salford Quays in a single new building. 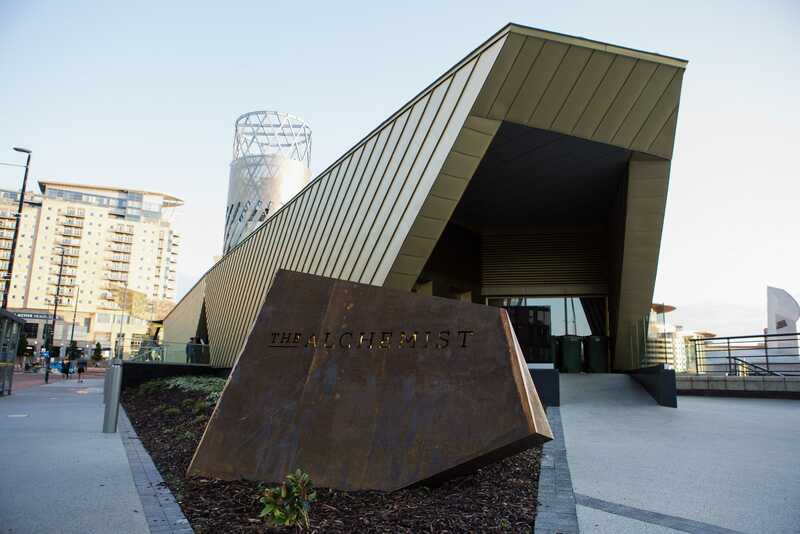 The Alchemist is located on the land bridge between Heron Basin and North Bay known originally as ‘The Bund’. 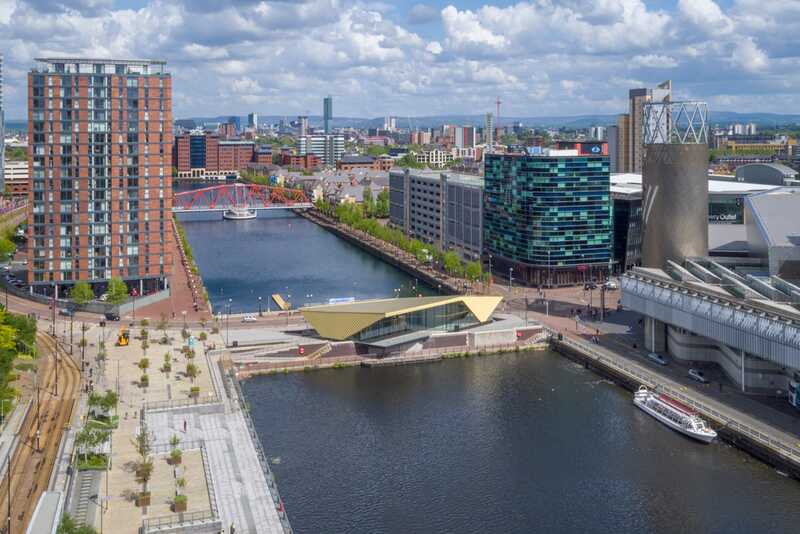 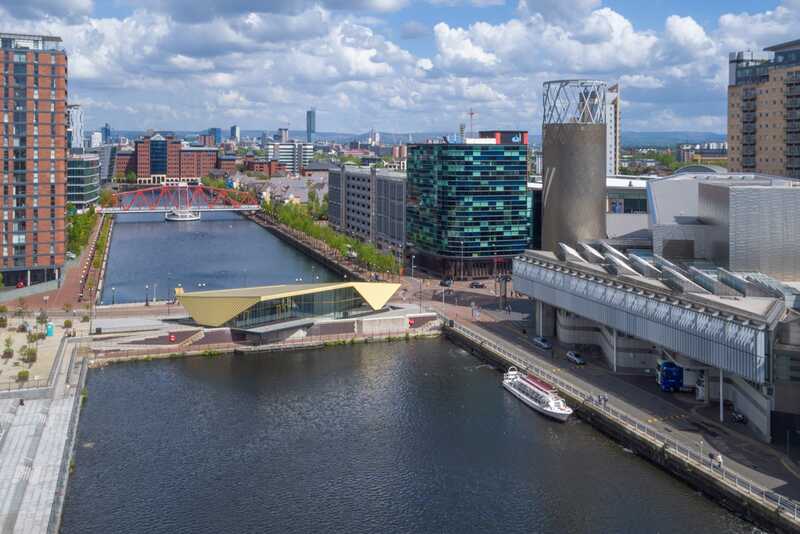 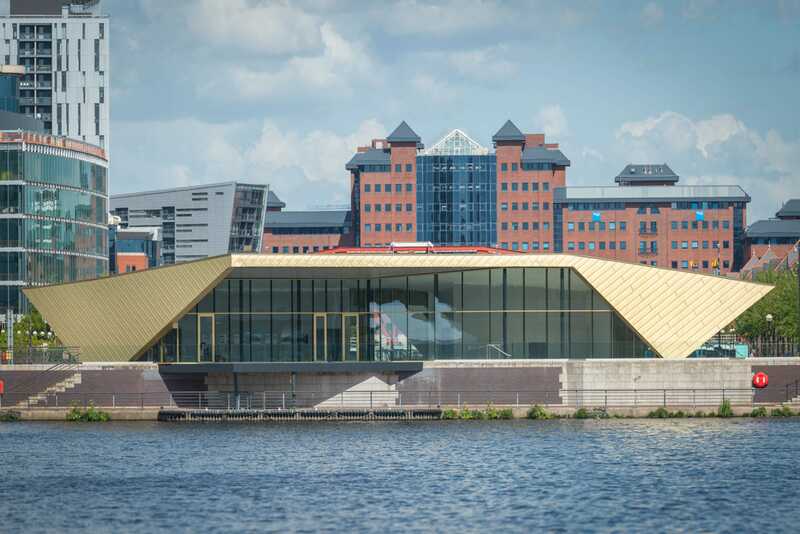 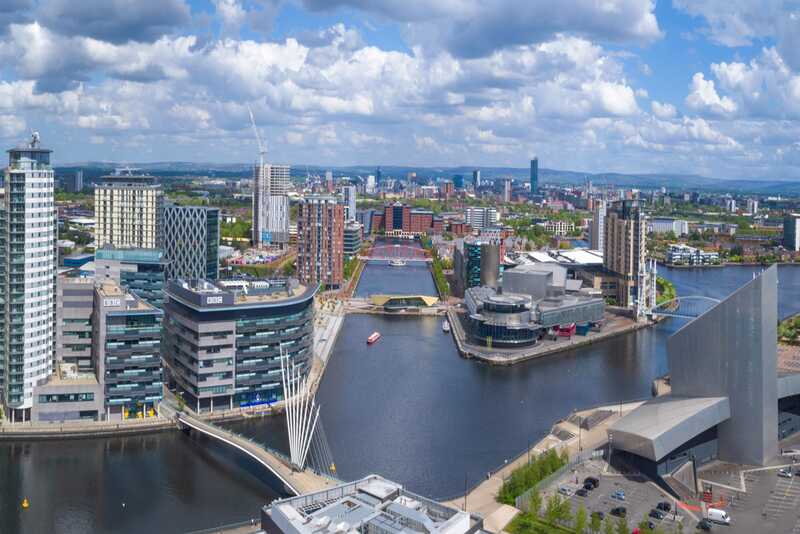 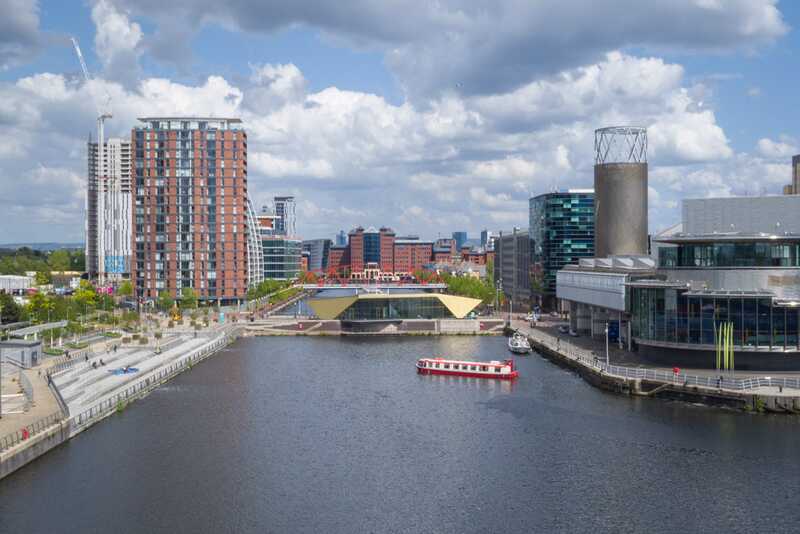 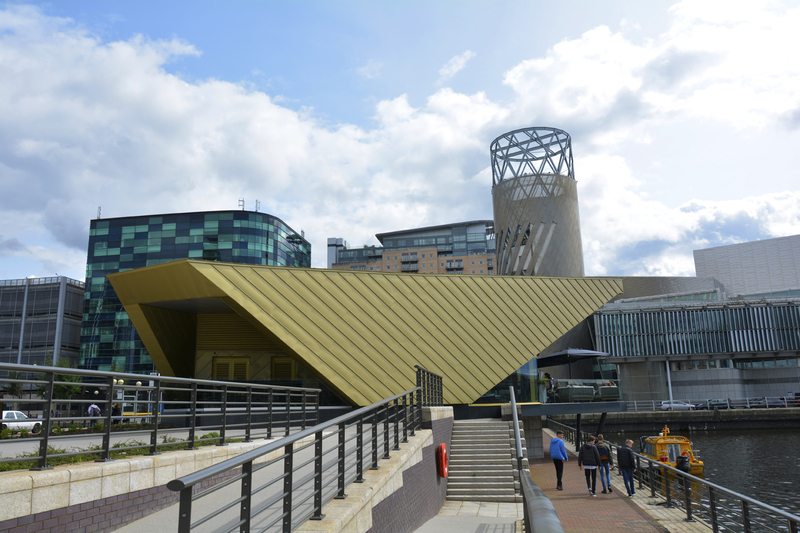 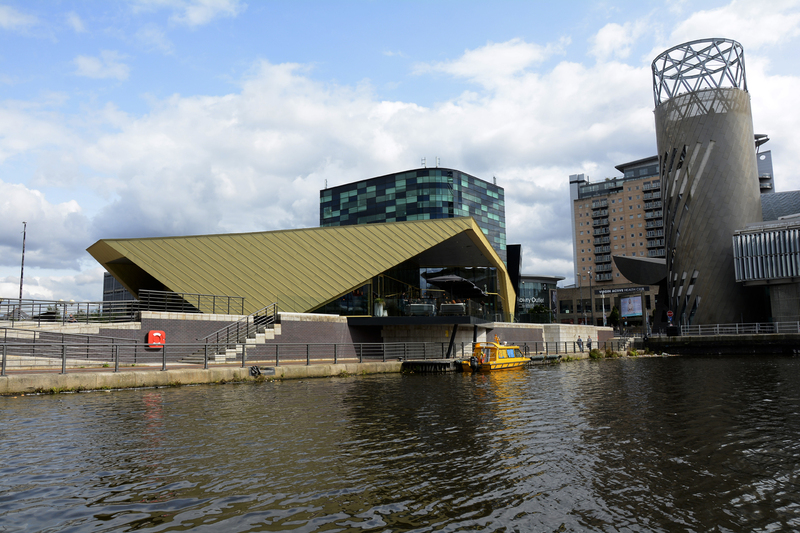 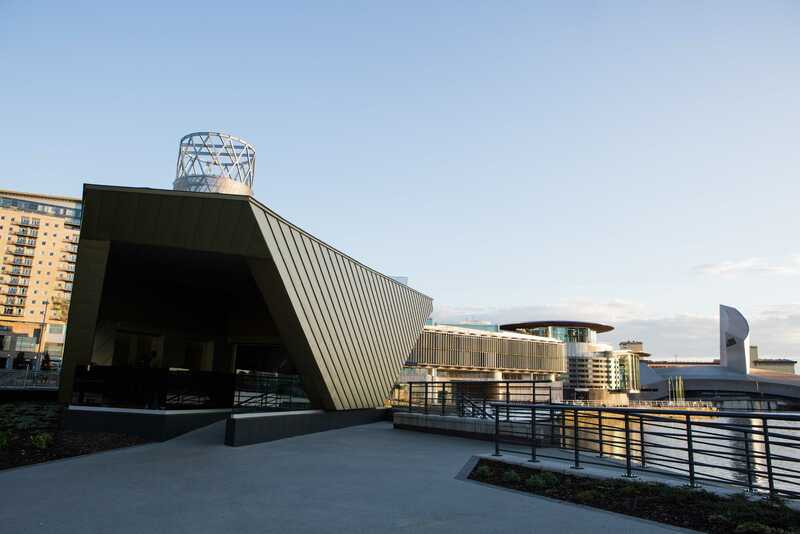 The bar’s outdoor terrace offers simply stunning views across the Manchester Ship Canal and a vista of all of MediaCity’s creative hubs including the BBC’s studios and Coronation Street’s studios, as well as the neighbouring Lowry Theatre and across to the Imperial War Musem. 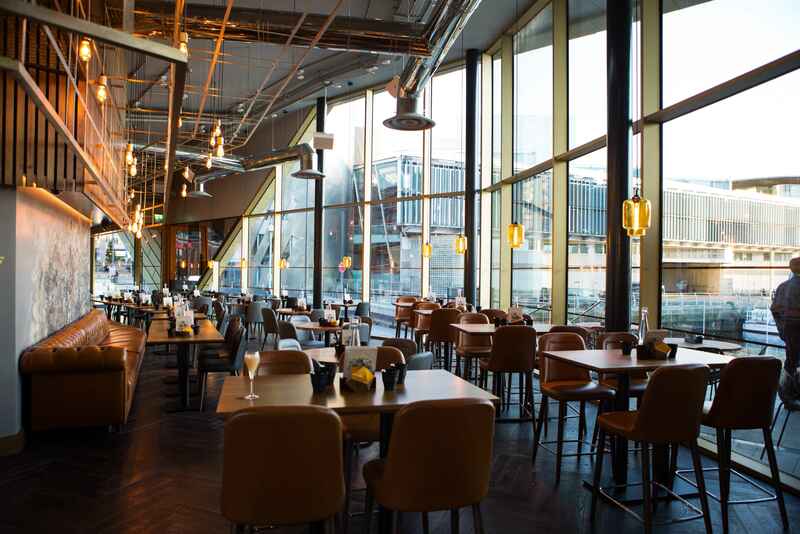 Inside the golden theme continues with gleaming lighting and sleek leather seating in the spectacular £1.2m venue. 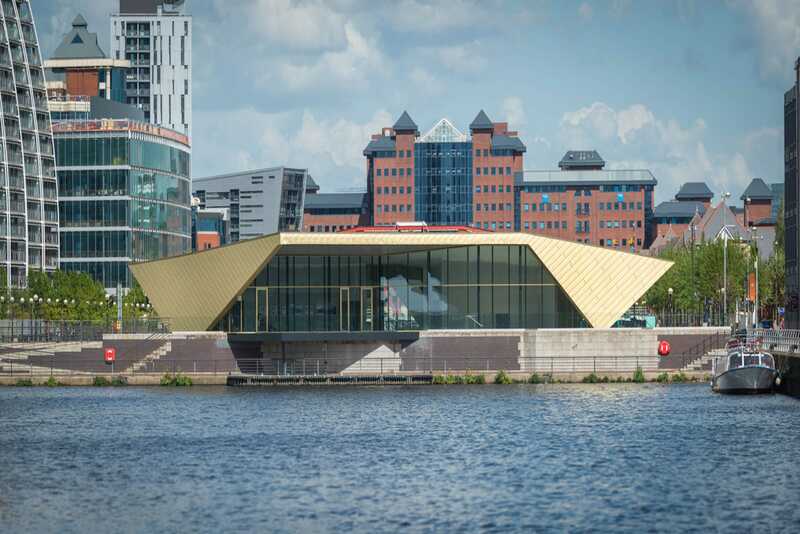 The bar has been some five years in the planning from Living Venture’s inspirational boss Tim Bacon and landowners Peel. 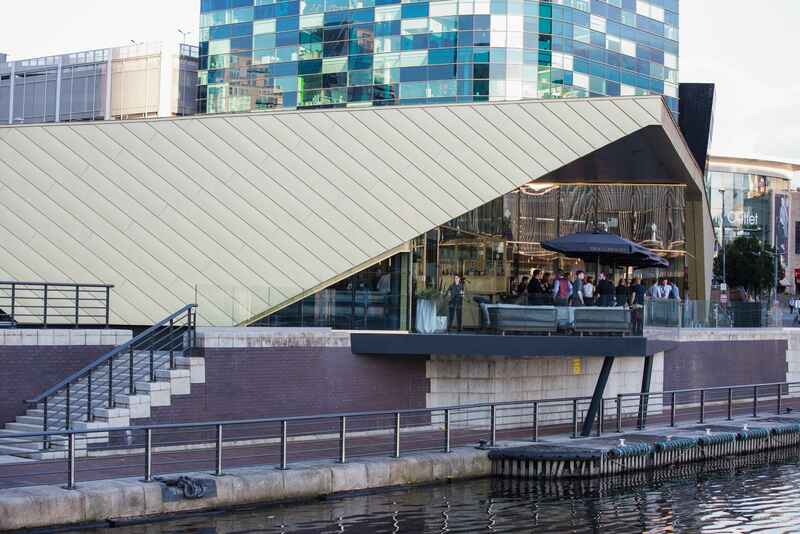 The Bund now known as The Alchemist, provides a revolutionary hybrid landscape in creating what is a unique and futuristic venue. 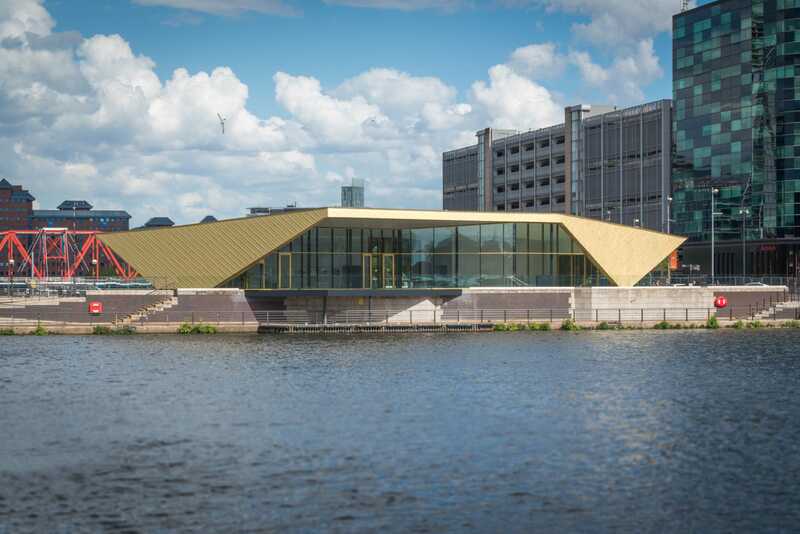 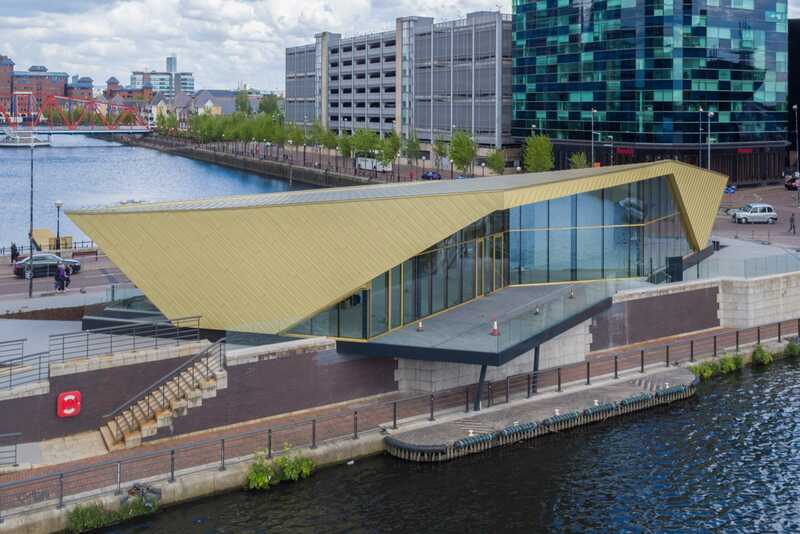 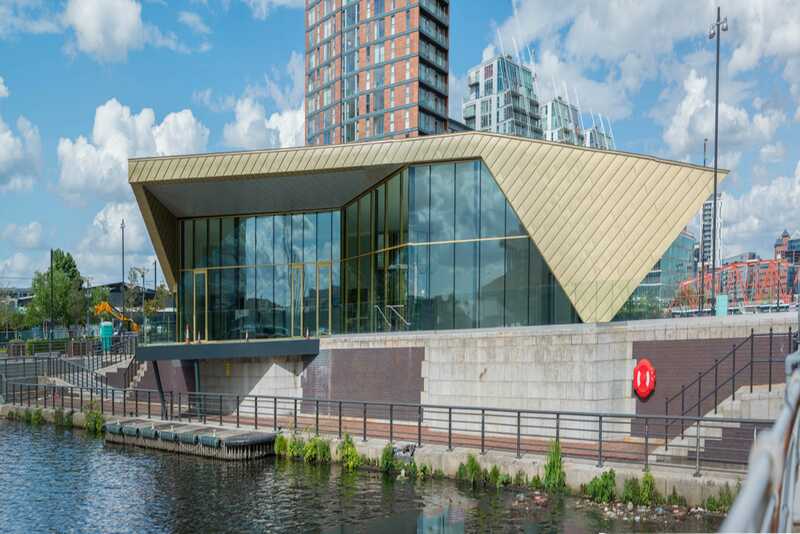 The new building’s gold roof and walls, and stunning terrace that cantilevers out over the canal, are designed to match the aesthetic and style ambitions of Living Ventures and of the high-class cocktail bar’s clientele. 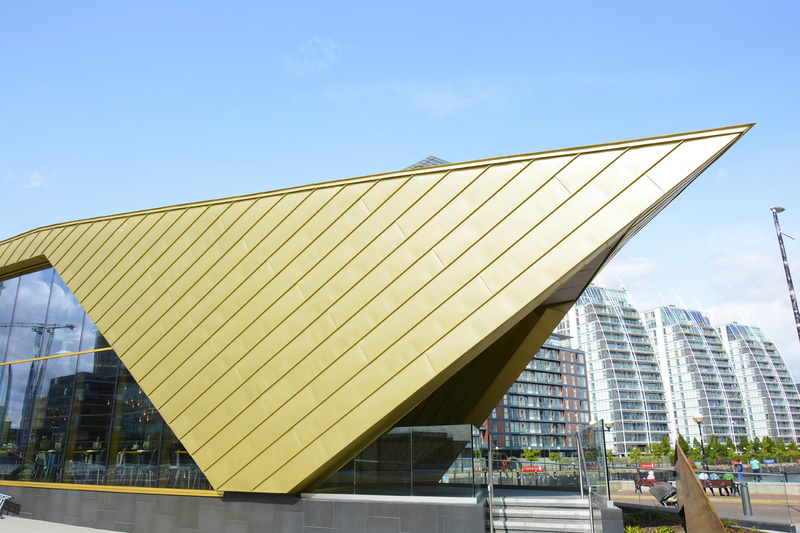 Longworth, who are renowned for their expertise in metal roofing, were commissioned to construct the building envelope by main contractors Artez Group and to realise Reid Architects’ golden vision. 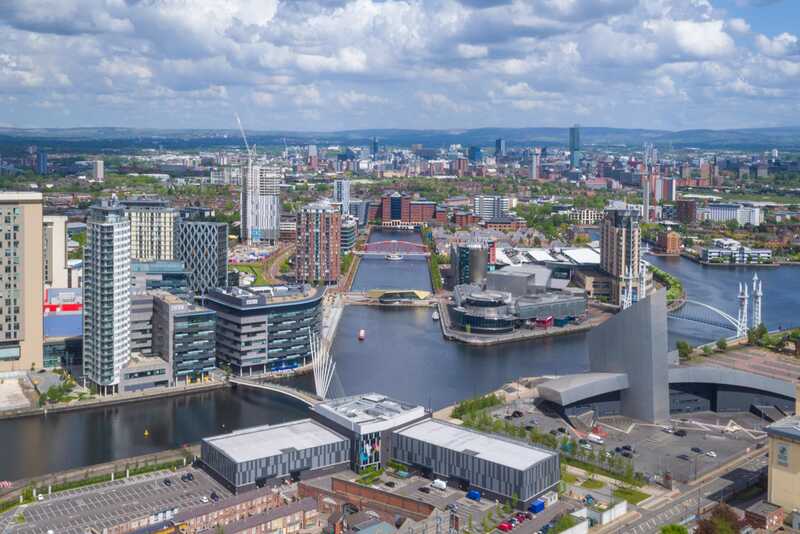 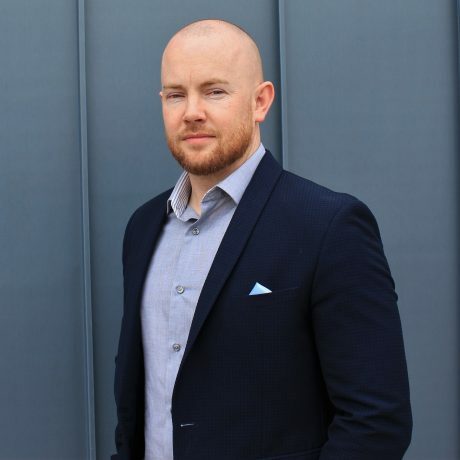 Longworth were appointed by Artez Group for the design and build of the envelope package for this prestigious and landmark development for their client, Media City UK Ltd (which is a joint venture between Peel and Legal & General). 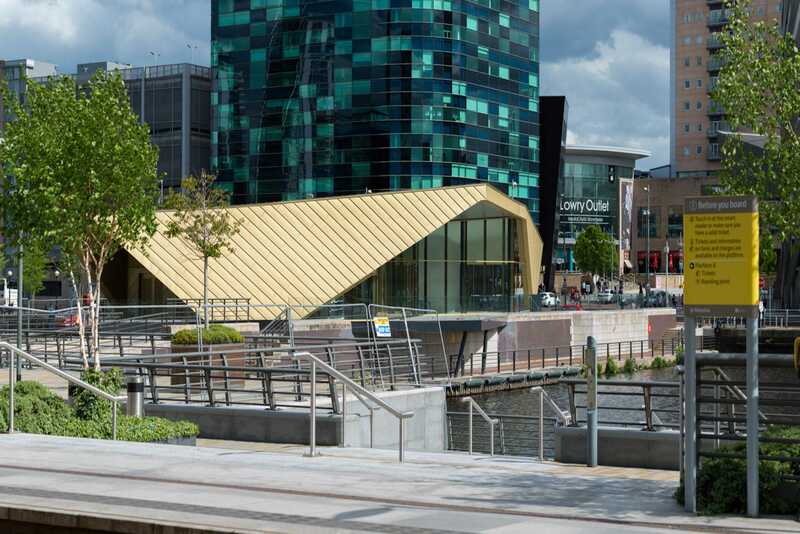 This was an incredibly complex job that only a handful of specialist contractors in the UK would have been capable of delivering. 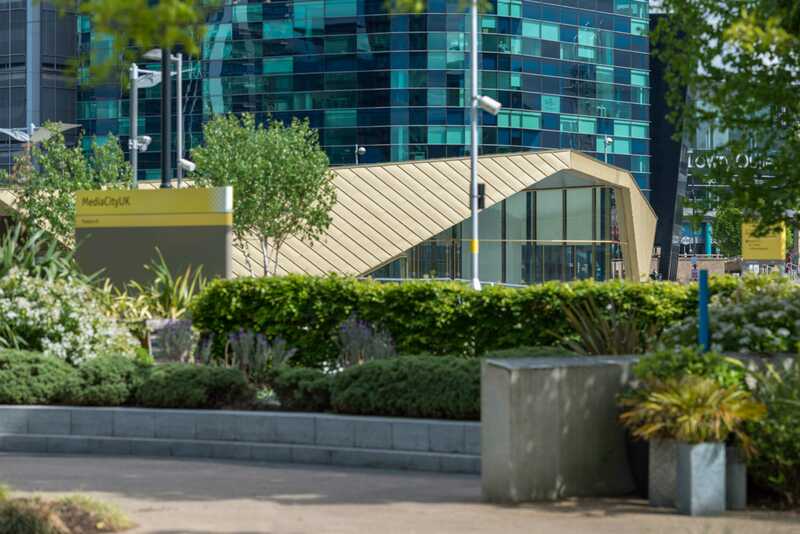 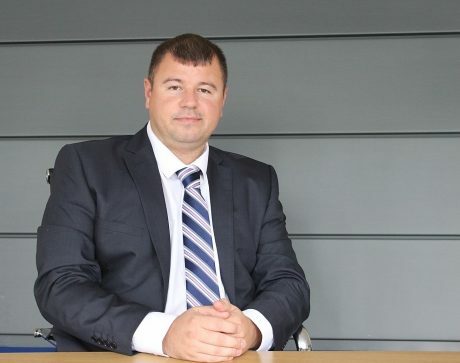 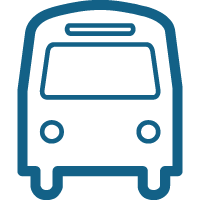 Longworth were heavily involved in the early stages of design and specification. 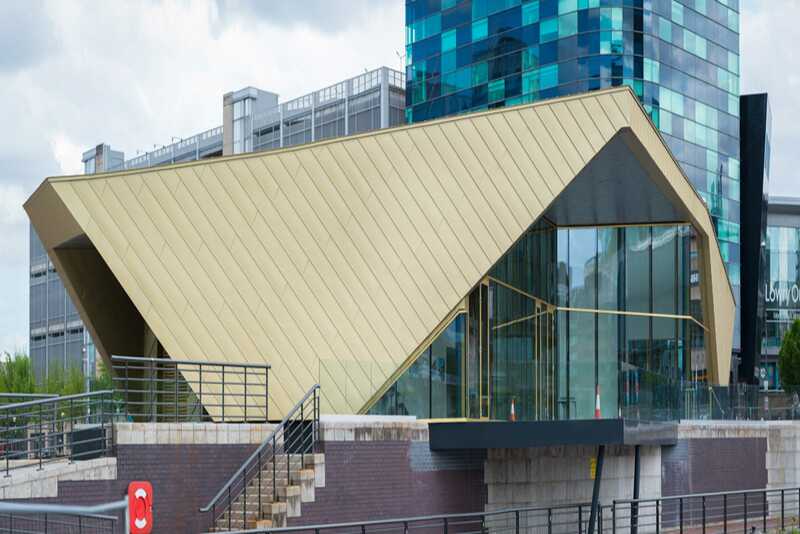 In order to achieve the desired aesthetic appearance, they engaged with their specialist supplier SIG Design & Technology and decided that ElZinc Rainbow Gold was the best product to provide the highest quality finish deserving of this ambitious project. 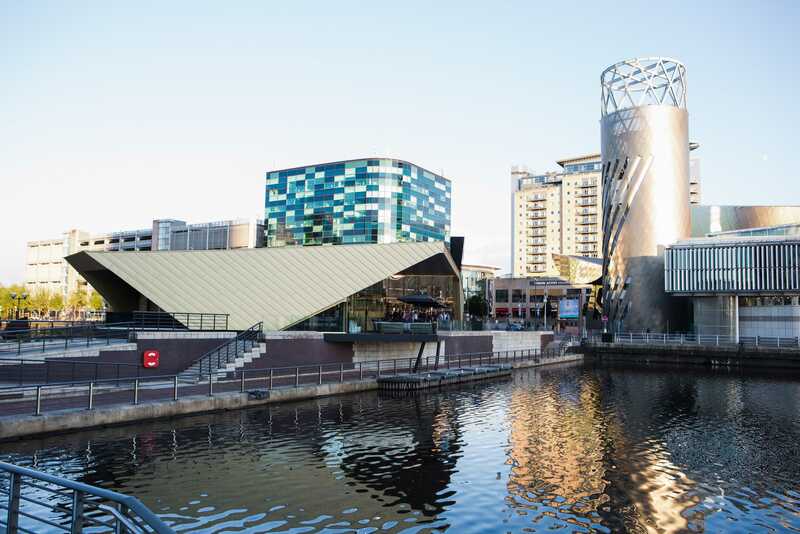 Longworth were responsible for the full build up and external envelope inclusive of the SFS and full substrate. 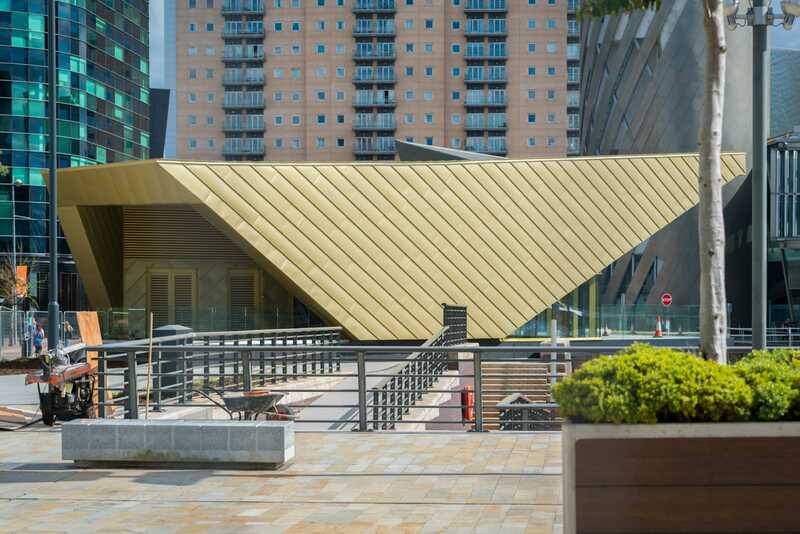 Almost 2000m2 of ElZinc Rainbow Gold installed in diagonal standing seams on a Admaster composite support system makes up the roof and façade. 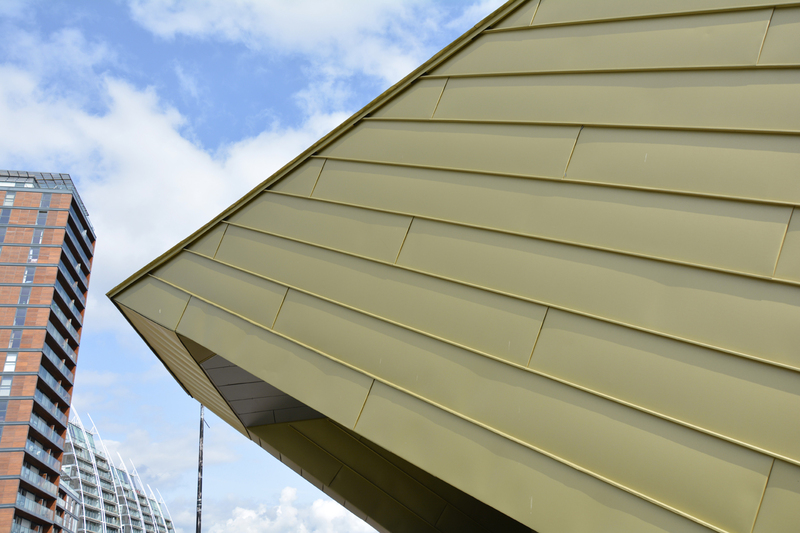 Fundermax High Pressure Laminate made up the soffit in a complimentary grey colour range. 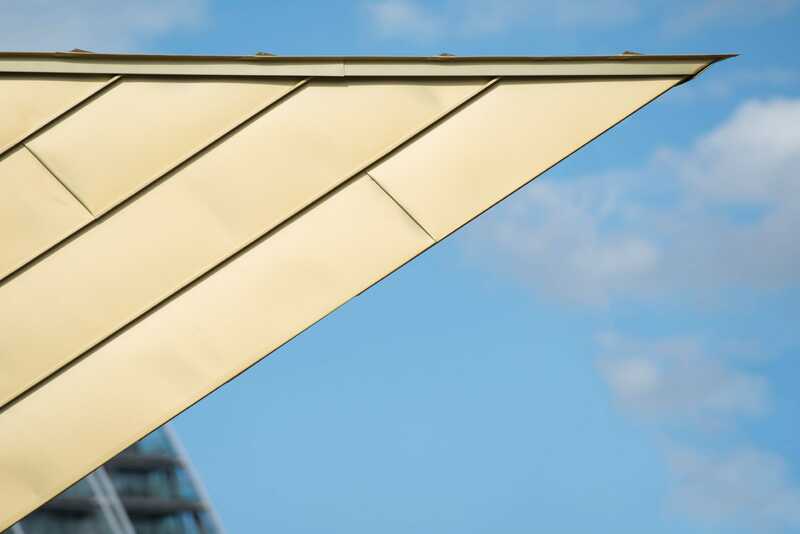 Colour coordinating the gold ElZinc panels and the fasteners was critical, which is why Longworth worked closely with SFS Intec to ensure complete colour consistency on the fastener heads. 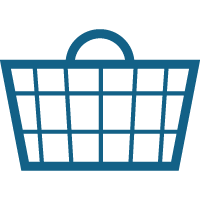 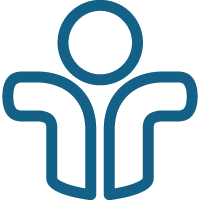 Longworth have long relied on the excellent quality of SFS products. 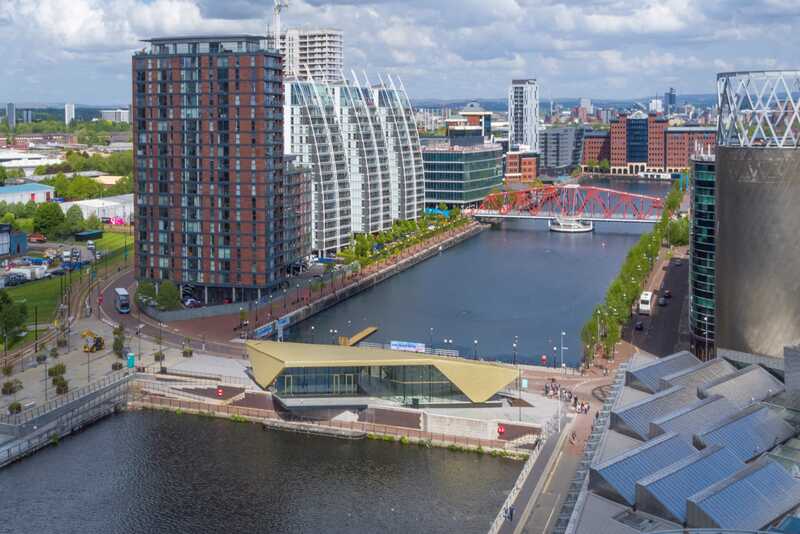 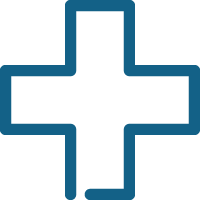 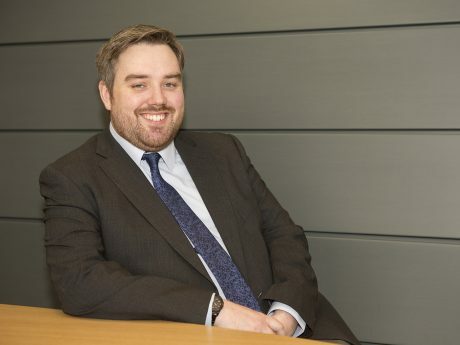 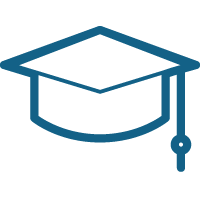 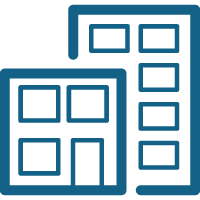 Longworth are very proud to put their name to this project and are sure that there will be many more special projects to come in the future. 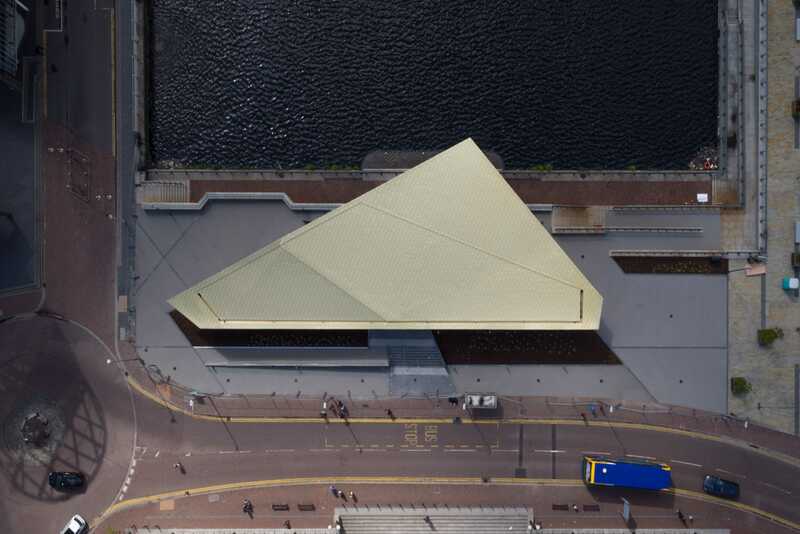 Click here for drone footage of the project.